Here’s the Resident Expert. She’s had that cap for years, in case you were thinking they sold caps that matched the building inside the Kona Hotel. 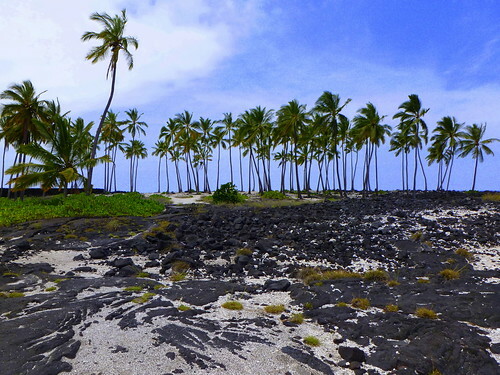 Next is the Place of Refuge, or Pu`uhonua o Honaunau, which has excellent snorkeling. Along with the many colorful fish, you get to see green sea turtles, eels, octopus, and rays. And finally, a Common Myna. So-called, because they are in fact quite commonly seen. They walk around in the road, and won’t get out of the way. You figure you’ve run over them, but they seem to be able to avoid road hazards quite well. 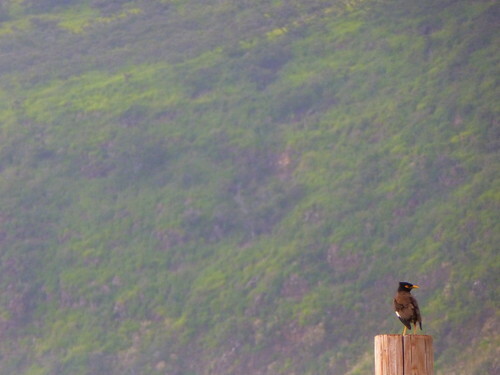 This guy is on a telephone pole near the house – that’s the cliff (pali) above Kealakekua Bay in the background.